Most people living in rural areas of developing countries have not got access to electricity and gas. 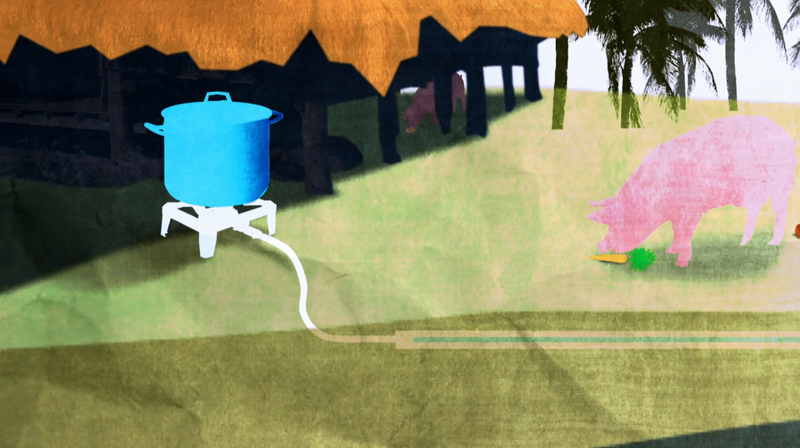 Before small-scale biogas plants were installed, families would cook their meals over an open wood fire. It is expensive, unhealthy and time consuming. Usage of firewood and charcoal contributes significantly to deforestation – a major cause of climate change. Slowing deforestation yields wide environmental benefits, such as biodiversity protection, reduced soil erosion and climate change mitigation. Cooking with biogas is a 100% clean solution. Domestic biogas provides a sustainable way for individual households with livestock to reduce dependence on firewood and fossil fuels: a biogas digester converts dung into biogas to be used for cooking, water boiling and lightning. The slurry left over from this process is an excellent organic fertilizer that can be applied to improve crop yields. Selling more vegetables and fruits, as well as leftover slurry, provides families with extra income. People – especially women and children – save time and money by not collecting firewood and buying charcoal, kerosene and chemical fertilisers. This time can be used for more productive activities, such as studying and entrepreunerships. Improved public health is another big advantage, as indoor air pollution is a major cause of premature deaths and serious illnesses, such as lung cancer, child pneumonia and heart disease. Not breathing toxic fumes from traditional fires during pregnancy helps mothers to give births to healthy babies. A market based biogas sector is needed to make domestic biogas broadly accessible. To create this sector, Hivos manages national multi-stakeholder programmes in several countries. Starting manufacturing companies and employing locally trained masons creates job opportunities among promotion, building and services. Introducing biogas technologies enhances local knowhow amongst energy solutions. Banks and microfinance institutions are encouraged to provide loans to construction enterprises and biodigester buyers. Most programmes offer investment incentives for around a quarter of the biodigester price. Hivos employs carbon finance to support this initiative, and to provide end-users with guaranteed product quality and after-sales service. Hivos has biogas programmes running in East Africa (Tanzania, Kenya, Uganda), South East Asia (Indonesia, Cambodia) and Central America (Nicaragua). In all these countries we partner with SNV Netherlands Development Organisation for technical assistance. We also work closely with the Dutch Ministries of Foreign Affairs, Economic Affairs, Agriculture and Innovation, national governments and rural development NGOs to carry out these programmes.